Check out all the things to do in Pigeon Forge in the winter with our Pigeon Forge Winter Travel Guide! The magic of winter is blowing into the Smokies in December, January and into February. Bundle up and head to the Smoky Mountains. Glittering Winterfest light displays twinkle throughout our mountain town, holiday music and the smell of crackling fires fill the air and the warmth of Smoky Mountain hospitality is felt everywhere. These are the days to head to Pigeon Forge, TN. See our other travel guides! The beauty of the winter season brings cooler temperatures and holiday spirit but also smaller crowds and a change of pace. During the months of December, January and February, life slows down a bit in Pigeon Forge and the Smoky Mountains and harkens back to a time when things were simpler. 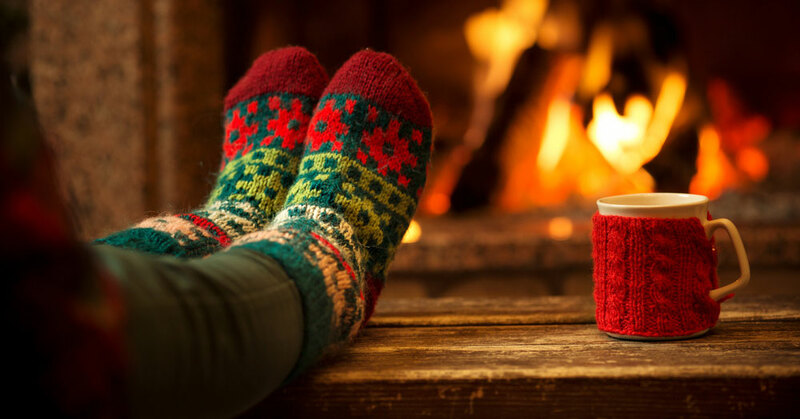 Curl up in a cabin with a fireplace and unplug with the ones you love. 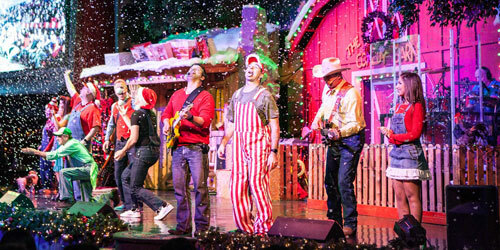 There are plenty of things to do in the winter in Pigeon Forge but being together is the best one. For smartphone users, the key to getting a great shot in low light is holding the camera steady. Try leaning against a lamp post or resting your elbows on a bench. The other important thing is getting the right exposure. If you have an iPhone, you can adjust exposure in photo mode by tapping the screen (where the subject of the photo is) and then swiping down to make it darker. For more photo tips, check out our guide to taking pictures of Winterfest lights. As the day begins to sink beneath the mountains, millions of lights begin to light up the night sky. It is easy to see why Winterfest in the Smoky Mountains draws visitors from around the country to see the wonderous display of sparkling lights. Displays of wandering wildlife, the twelve days of Christmas, seasonal characters and more illuminate the parkway and businesses across Gatlinburg, Pigeon Forge and Sevierville. Drive down the Pigeon Forge parkway and experience the magic of our famous Winterfest lights. Whether you start from the north or south end, this helpful map will guide you to your favorite displays in any direction. Use the plus & minus buttons to zoom in & out and click and drag the map to change your position. Scroll through the legend to read more about the displays, or click the icons on the map. Click on the map icons to read their descriptions. Pigeons In Flight At the north and south ends of the parkway, you'll be welcomed by these friendly avian displays. Pigeon Forge Welcome Sign Lit up in Winterfest lights, this friendly and familiar marker will get you in the holiday spirit as you set off down the parkway. Forging Winter One of the largest displays in the area (110 feet long & 21 feet tall), this structure is a tribute to Pigeon Forge's founding fathers. 12 Days Of Christmas As you drive down the parkway, you can find this visitor favorite between traffic lights #3 (partridge in a pear tree) and #7 (12 drummers drumming). Winterfest Express You can find this intricate and colorful display right in front of the Mountain Breeze Motel, across the parkway from Crave Golf Club. Fairytale Fantasy Just after the drummers drumming on the parkway, you'll find some familiar childhood characters like Mother Goose & Humpty Dumpty in animated displays between traffic lights #7 and #10. Mill Scene This recreation of Pigeon Forge's classic Old Mill incorporates over 6,000 sparkling lights, a spinning waterwheel, & a flowing river. Dolly Parton's Stampede The 40 foot tree outside of Dolly Parton's Stampede takes 5 days to put up and decorate. This year promises some of the most lights ever. Smoky Mountain Opry A staple of the parkway's Winterfest displays, the lights of the Smoky Mountain Opry are a great start to your journey from the north end. The Island You can spot the 200 foot Great Smoky Mountain wheel lit up in red, green, and white from the Pigeon Forge parkway. The Old Mill One of the oldest businesses in the area, The Old Mill welcomes you to Winterfest under the cascading string lights hung over the adjacent bridge. Patriot Park The Americana themed displays at Patriot Park make up the largest collection of lights in the area. Wonderworks You can't miss the upside-down house as you're traveling down the parkway. Wonderworks will be festively decorated and aglow with it's columns wrapped in bright red ribbons. Santa & the most beautiful Christmas tree make a great backdrop for your next family photo at Ripley's Aquarium. Get your holiday sugar fix at Crave Golf Club. The courses are turned into candy wonderlands for the season. There are three bridges with light displays you don't want to miss: Jake Thomas Rd., Old Mill Ave., & Dollywood Ln. The Incredible Christmas Place is in the holiday spirit year-round, but you can't miss their special winter lights. December is truly a time to get in the holiday spirit. Winter finally feels like it has arrived, and there are so many fun family activities to enjoy together. Take a winter getaway with your loved ones this season and check out some of these events. Red Roof Inn Pigeon Forge: This award-winning Santa Claus will be at Red Roof every Saturday in December. The Old Mill: Enjoy breakfast or brunch with both Mr. & Mrs. Claus at Pottery House Café & Grille. Smokies Stadium: Visit Santa's workshop free when you buy tickets to see the lights at Shadrack’s Christmas Wonderland. The Incredible Christmas Place: It's no surprise that the south's largest Christmas store is visited by Santa every year. Santa's Claus-et: This unique little shop in Gatlinburg offers professional quality photos with their very own Santa Claus. The Island: Find Santa between 3:00 and 9:00 pm on the Island's breezeway during these dates. LeConte Lodge sits upon an open glade just under Mt. LeConte's summit. At an elevation of about 6400 feet, it is the highest guest lodge in the eastern US. The only way to get there is on foot (there are 5 hiking trails), as there are no roads leading directly to the lodge, but the trek through the Smokies is worth it - you'll find some of the most spectacular views in all of the park. The lodge has been around since 1925 and is actually fifteen years older than the Great Smoky Mountains National Park itself. The team of caretakers at the lodge operate the website and blog High On LeConte, where they provide trail information, interesting tidbits, and gorgeous photos. This photo is one of our favorites from Christmas of 2017. Roads & facilities in the National Park close from time to time due to unsafe conditions & repairs. Know before you go: NPS.gov. Look but don’t touch! Do not stand on, go beneath or try to break off the ice from frozen waterfalls. They are slippery, unstable and can be very dangerous. If the wintry outdoors are a little too chilly for your liking, consider making the lodging portion of your holiday trip to the Smokies part of the vacation in itself. Here are our top picks for where to stay this winter. Find the perfect winter lodging for your vacation. Cabins With A Fireplace: Who could deny the comforts of cozying up near a fireplace on a crisp winter evening? Hotels With Indoor Pools: If you're traveling with the family, this is a great option. Indoor pools are a wonderful treat for kids looking to burn off some energy. Cabins With A Hot Tub: Brace the chilly night air in your swimsuit and ease into a bubbling hot tub to take the edge off - it's worth it. Every year, the Smoky Mountains host hundreds of groups from small, intimate weddings and family reunions to large youth conferences and sporting events. The early part of the year is considered the off season in Pigeon Forge & Gatlinburg, and that means less crowds & lower rates. There is literally something for everyone to enjoy in the Smokies, and we have the space to host your gathering no matter what the size. While there are many theories on the origin of Valentines Day, one thing we can all agree on is that is a time to celebrate love, friendship, and the joy of having other people in our lives. It’s a day of flowers, candy, and sharing time with those you cherish. For years, couples have flocked to the Smoky Mountains to share their love, celebrate their marriage, or rekindle their relationship. There’s something about these mountains that bring two people together. Sink into relaxation and retreat from the busyness of life with a tranquil couple’s massage. Let the therapists at Riverstone Spa treat your senses and rejuvenate your body. Enjoy a wine tasting at one (or all!) of the five wineries of the Smoky Mountain wine trail. Purchase a bottle to enjoy with your love on the deck of your cabin in Pigeon Forge. Grab a cup of coffee and warm up to watch the sun rise. With an elevation of 6,643 feet, it is the perfect spot to watch the day begin with the one you love. Take your valentine on a romantic dinner date. Whether it's pizza for two or a candlelit dinner overlooking the river, just taking a moment to share time together is what Valentines is about.